Downtown Mount prime location, overlooking the palm trees and the thriving downtown scene. Restaurants catering to all tastes at your doorstep. Ocean or harbour beach within easy two blocks walking distance - park the car in the garage and relax ! Also very close to the movies, hot pools and parks. You don't really need to use your car once you get here as everything you'll need is in walking distance. 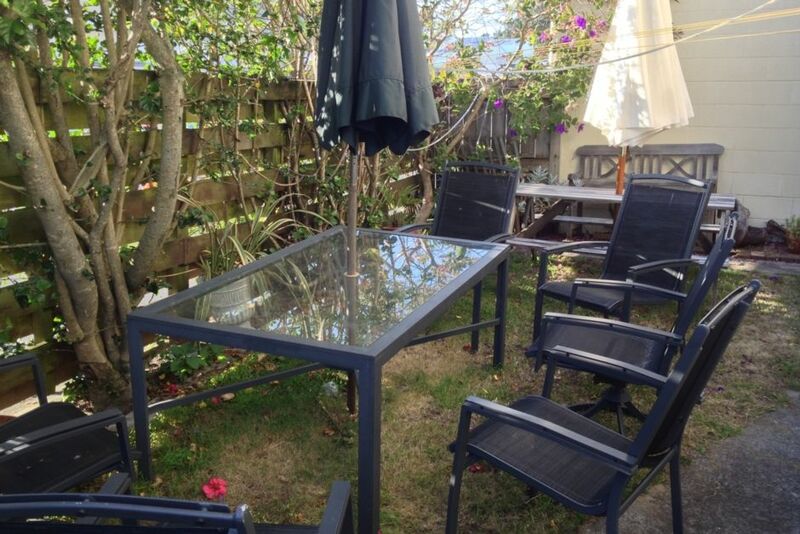 Private grassed courtyard area with tables and BBQ. On site parking for one vehicle and plenty of additional parking in public carpark which is monitored by Police closed circuit TV camera. Not available over Xmas/New Year period. Upstairs location and chattels not suitable for young children. Tenants must include person making the booking and must not exceed the number booked. Property management services on site in separate unit. Great location. Short walk to the beach. Parking great. Very central location. The property was clean and tidy and more than adequate for our needs. Loved the location and the kitchen and dining areas were great, We like to cook and had everything we wanted. Good location in the centre of Mt. Good location in the centre of Mt. Maunganui. Property is a little dated and the shower is disappointing. Very comfortable bed. The apartment is right in the heart of Mt Maunganui - very handy to shops and cafes and the Sunday Farmers market which is right next door. Everything was as described and we found it very comfortable. It did get a little noisy late at night with people leaving the nearby pubs and restaurants, but maybe that's summer weekends only.